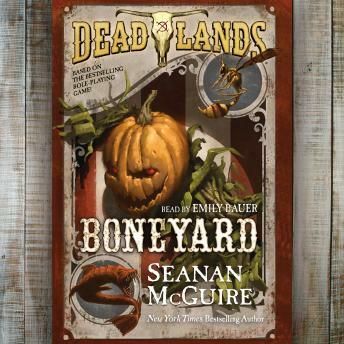 From the twisted mind of Seanan McGuire comes Deadlands: Boneyard - the newest audiobook based on the hit Weird West RPG franchise DEADLANDS! Step right up to see the oddities and marvels of The Blackstone Family Circus and Travelling Wonder Show! Gasp at pit wasps the size of a man's forearm. Beware the pumpkin-headed corn stalker, lest it plant its roots in you! Annie Pearl is the keeper of oddities, the mistress of monsters. Her unique collection of creatures is one of the circus's star attractions, drawing wide-eyed crowds at every small frontier town they visit. But Annie is also a woman running from her past . . . and the mother of a mute young daughter, Adeline, whom she will do anything to protect. The Clearing has it secrets, and so does Annie. And it may take everything she has to save her daughter-and the circus-from both. Deadlands: Boneyard is a gripping audiobook of the Weird West, set in the haunted frontier of DEADLANDS, the award-winning game from Pinnacle Entertainment Group.